In 2009, California-based company, Vapur, came up with an idea to inspire and support active lifestyles with innovative and portable products. 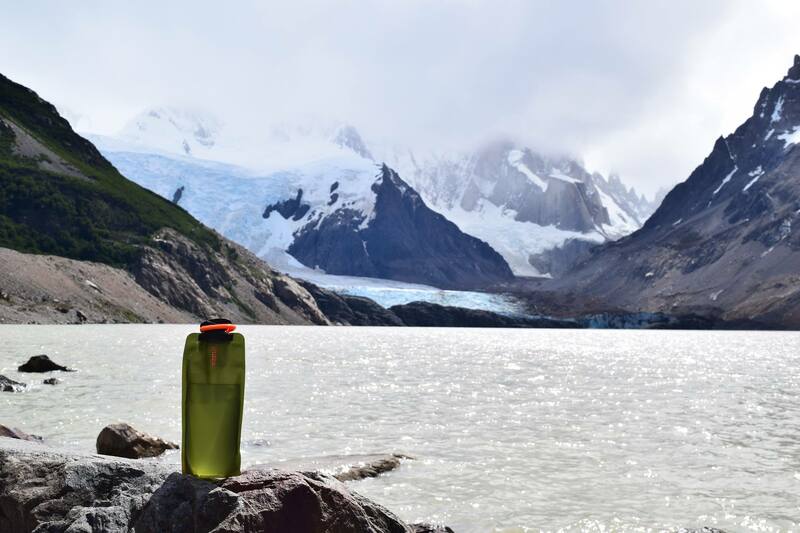 Their “Anti-Bottles,” as they came to be known, offer customers water bottles that are flexible enough to fold and pack in a backpack and are 87% less heavy than a typical rigid bottle. According to Vapur’s co-founder Brent Reinke, the goal of the company was to “change people’s mindsets” about the ways in which people hydrate. But they didn’t just want to offer an alternative water bottle, they wanted to improve access to clean drinking water across the country. So the company partnered with public lands, schools and hospitality services to offer their products at a discount and make anti-bottles available for purchase in stores. Then, in 2012, the company launched the Vapur Hydration Program and established partnerships with public lands to install water refill stations, manufactured by Elkay. 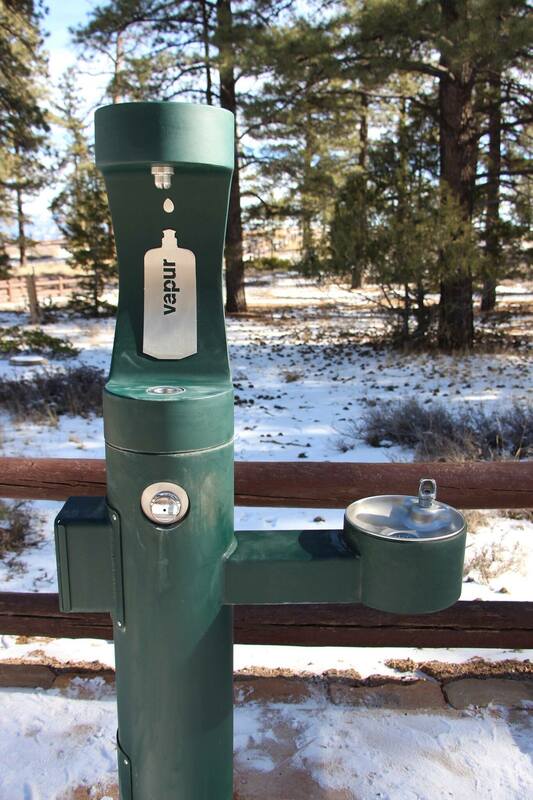 Refill stations, where visitors can fill up their own bottles for free, are now located at Bryce Canyon National Park, Yellowstone National Park Lodges, Springdale, Utah – the gateway community for Zion National Park – as well as other public lands and communities. As many parks and partners are now considering banning the sale of one-time use disposable plastic bottles, what Bradybaugh called “throwaway bottles,” he explained that there was a need to provide alternatives for visitors to stay hydrated. By making these refill stations available, visitors have access to water without adding to the amount of plastic waste in our public lands. Already, they have installed refill stations in the lobby of Mammoth Hot Springs Hotel, eliminating the equivalent of 86,000 disposable water bottles from being used at that location from 2013 to 2015. By removing plastic water bottles from their gift shops and vending machines, Yellowstone National Park Lodges are encouraging their guests to choose more sustainable options. They also promote the sale of reusable bottles by placing Anti-Bottles in each guest room with the option to purchase, and by selling these and other reusable bottles in their shops. And while they’ve made giant steps to remove plastic water bottles, Yellowstone National Park Lodges still makes cans of water available for purchase at some of their go-to food locations, in case customers deem that to be their best choice to stay hydrated while enjoying the outdoors. This year, Vapur has also seen an increase in partners for their hydration program from communities that support public lands and are considered “gateways” to our nation’s special places. Springdale, Utah, a small town of less than a thousand, stands at the entrance to Zion National Park and welcomes visitors to the park each year. Now, with a refill station located outside of Bumbleberry Inn, a place that also serves as a stop on the shuttle into Zion, the people of Springdale are sending a message that encourages visitors to fill up on water rather than bring single-use plastic water bottles into the park. The partnerships Vapur is developing through their Hydration Program promote the idea that we can stay safely hydrated, enjoy our public lands and still keep them free of the plastic waste caused by water bottles. To learn more about this program, visit their website at vapur.us/hydration-program. This year, the Public Lands Alliance awarded Vapur the Corporate Stewardship Award at the Partners for Public Lands Convention and Trade Show in Spokane, WA. The Corporate Stewardship Award recognizes a company that has demonstrated exceptional achievement to enhance the quality of the visitor experience in America’s public lands. Because of Vapur’s commitment to reducing plastic waste on public lands through partnerships, the Alliance deemed them highly worthy of this award. For more information on the Partnership Awards Program, visit publiclandsalliance.org/partnership-awards.